This is a Sponsored post written by me on behalf of HUGGIES. All opinions are 100% mine. I'm not a mother myself, just a guardian to cats, but my mom always told me several of her own memorable mommy moments that she'd never let me live down. One that I never, ever, got to live down, and will always remember since it was something I was told often, was when I was a baby and apparently was really into finger painting. One piece of advice she definietly left me with in this story is to always use quality baby essentials for your kids, especially diapers. One of the best known brands of today is HUGGIES®, of course. I love that they not only have their diapers like HUGGIES® Little Snugglers Diapers, but also HUGGIES® Pure & Natural Diapers and HUGGIES NATURAL CARE® Wipes these days. 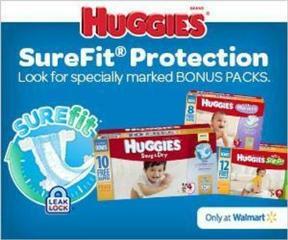 Plus, they are available at Walmart so you know that you can always get a great deal on quality diapers for your baby.